Ingredients: water, Cetrimonium Chloride (preservative), Cetyl Alcohol (emollient), Cetyl Esters (emollient), Stearyl Alcohol (alcohol), Amodimethicone (insoluble silicone), Trideceth-12 (substancja myjąca), Dimethicone (insoluble silicone), Cyclopentasiloxane (strong silicone), Behentrimonium Chloride (preservative), Hydrolyzed Keratin (keratine proteins), Argania Spinosa Kernel Oil (argan oil), Vitis Vinifera Seed Oil (grape oil), Propylene Glycol (alcohol), kompozycja zapachowa, Panthenol (provitamin B5), Tocopheryl Acetate (antioxidant), Helianthus Anuus Seed Oil, Keratin, Sodium PCA, Sodium Lactate, Arginine, Aspartic Acid, PCA, aminoacid complex, preservatives. The components of Oil of Morocco balm are rather good. The information on the packaging about the formula free of sulphates is true, and can be confirmed by a more detailed look at the active ingredients list. Unfortunately, at the beginning of the composition, we can see a few chemicals and then, finally, keratin. Argan oil is not a base component of the product, what you would expect from the name. The cosmetic is rather argan oil enriched, because the component is located only on the 12th position in the composition! Hair balm from Marc Anthony also comprises vitamins, amino acids and some natural oils. Use: Apply on clean, damp hair, massage into scalp and leave in for a few minutes. Rinse with warm water. There is nothing to surprise you when it comes to the form of application, therefore, it does not cause any problems in everyday use. 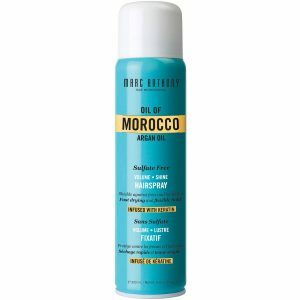 Oil of Morocco has a very creamy texture, which is typical for hair balms of concentrated action. It is easily distributed, but you need a lot of it to thoroughly cover medium-length hair. Such feature results in lower efficiency. Although hair balm with argan oil from Marc Anthony is dense, it does not weigh hair down, does not stick it and is very easy to rinse. After washing, your hair is very soft and delicate and can be easily combed through with your fingers. In addition to eliminating the problem of tangling and frizz, Oil of Morocco balm adds healthy look to the hair. Deeply moisturised, nourished and strengthened hair are the effects noticeable after first few weeks of regular use. You cannot deny the effectiveness of this cosmetic.